Today the Met Office has released its long-range outlook for December 2016 to February 2017, highlighting the risk of a cold start to the winter for the UK. Latest observations from around the globe and long-range weather prediction systems suggest that the early part of the winter period is more likely than usual to be cold. This implies a heightened risk of wintry weather during December and into January. Overall, it should be stressed that more normal winter weather, with temperatures ranging from slightly below average to mild, is still marginally more likely. Nevertheless, the risk of cold conditions at the start of winter is now greater than it has been in recent winters. More details of specific weather over the coming month is available in the Met Office 30-day and week-ahead forecasts. The graphic below illustrates the current outlook for temperatures in early winter. For a normal year the most likely outcome is in the near average category. 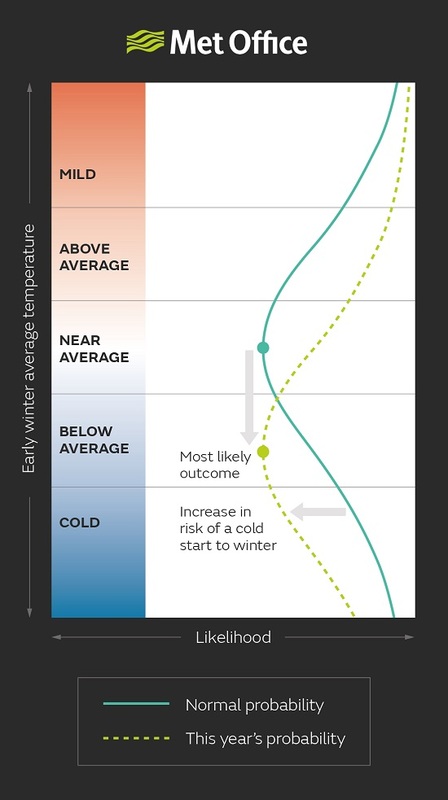 This winter, however, the probability is shifted towards below average temperatures, with the most likely outcome – the widest part of the curve – remaining above the ‘cold’ category. Our winter weather patterns respond to influences from across the globe: Currently, the winds circulating around the North Pole in the stratosphere – between 10 and 50 km in altitude – are much weaker than normal and this is expected to weaken the westerly winds across the Atlantic. Furthermore, tropical East Pacific Ocean temperatures are slightly below average, just above the threshold for La Nina. Although these cool conditions also tend to impede the UK’s usual westerly winds in early winter. Warmth in the North Atlantic Ocean near Newfoundland and record low Arctic sea ice are also contributing to the same tendency, favouring a colder-than-average early winter. Later in the winter, there appears to be a shift towards less risk of cold conditions. More detail about this period will be available in updates to the Met Office long-range outlook which will be released as winter progresses and our 30-day and week-ahead forecasts will provide advance warning of specific weather events throughout the winter. This entry was posted in Met Office News and tagged climate, cold, dry, England, forecast, ice, Jet stream, Met Office, National Severe Weather Warning Service, rain, snow, statistics, temperature, UK, weather, Winter. Bookmark the permalink. The shift to very mild weather from the 6th December suggest the predicted cold start to winter will on balance be cancelled out. The temperature for December will above average by next weekend. Weather models may be improved but it still seems difficult for forecasters to get it right even for just a few weeks in advance. Based on local observations and met office forecast up until Tuesday 13th the mean temperature is heading for +3 above 1981-2010 average. So much for early winter predicted cold start. January to March 2017 North Atlantic and Arctic Oscillation Forecast.